I think most people have some type of debit or credit card, Although it may help stores from being robbed. A few convenience stores such as WaWa, 7-11, and a few gas stations in the Far Northeast right on border of Bucks County PA (outside Philly) have been robbed at gun point over the past fews years sometimes on weekly basis. 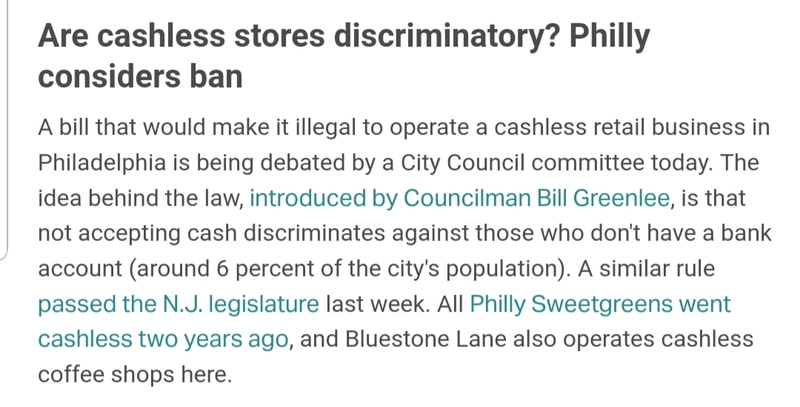 Being robbed often, cigarertte and beverage tax have caused businesses to close down completely (WaWa & 7-11) or forced them to close earlier in the evening. I think we had the only WaWa that closed at midnight before they closed down completely. However I do not think its fair to limit people on how they choose to pay for things. I personally prefer cash and wouldn't be happy if I was forced to use a debit/credit card. I probably wouldnt use these stores that didnt accept cash. The shops that do this mentioned in the article tend to be in wealthy neighborhoods or where wealthy people tend to frequent. At some point in time I am sure it will come down to cashless transactions everywhere. Can I pay cash? I don't have a credit card.